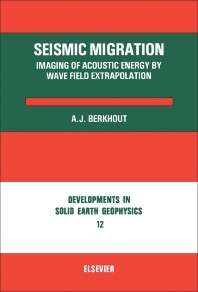 Seismic Migration: Imaging of Acoustic Energy by Wave Field Extrapolation derives the migration theory from first principles. This book also obtains a formulated forward modeling and migration theory by introducing the propagation matrices and the scattering matrix. The book starts by presenting the basic results from vector analysis, such as the scalar product, gradient, curl, and divergence. It also describes the theorem of Stokes, theorem of Gause and the Green’s theorem. The book also deals with discrete spectral analysis, two-dimensional Fourier theory and plane wave analysis. It also describes the wave theory, including the plane waves and k-f diagram, spherical waves, and cylindrical waves. This book explores the forward problem and the inward problem of the wave field extrapolation, as well as the modeling by wave field extrapolation. Furthermore, the book explains the migration in the wave number-frequency domain. It also includes the summation approach and finite-difference approach to migration, as well as a comparison between the different approaches to migration. Finally, the book offers the limits of lateral resolution as the last chapter.